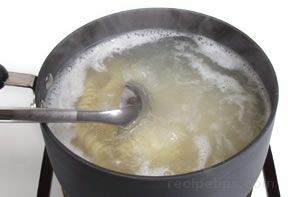 Boiling is the method most often used for cooking pasta. It is also used in conjunction with some of the other cooking methods, such as stir-frying and baking. When boiling pasta it is important to use a sufficient amount of water, generally a quart of water per 4 ounces of pasta is satisfactory. Using additional water is beneficial in that it is easier to maintain a constant temperature during the cooking period, which allows the pasta to cook more evenly. 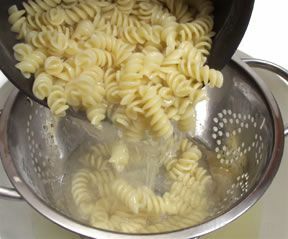 Most pastas are cooked in the same manner when using the boiling method but some types may vary slightly in some of the processes. Add at least 4 quarts of water to a large pot. Keep in mind that dried pasta expands quite a bit when it is cooked, so make sure the pot you select to cook your pasta in is large enough. 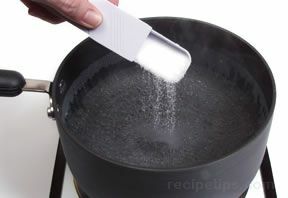 One tablespoon of salt should be added to the water as it begins to boil. If the salt is added too soon it can give off an odor, which can affect the taste of the pasta. If it is added immediately before the pasta, the salt may not have enough time to completely dissolve in the water. The salt helps bring out the flavor in the pasta and helps it hold its shape. Heat water over high heat and add one tablespoon of salt to the water as it begins to boil. 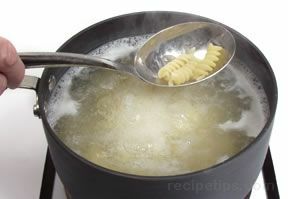 When the water has reached a full boil, add all the pasta and stir immediately to prevent the pasta from sticking together. It is sometimes suggested to add a little oil to the cooking water to help prevent the pasta from sticking together. Most experts advise against doing this because the oil will coat the pasta and prevent the sauce from sticking to it. Only use oil when cooking sheets of pasta such as lasagne, which have more of a tendency to stick together. 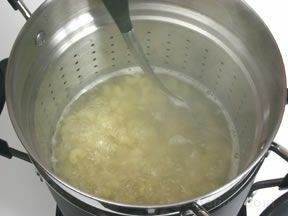 Once the pasta is added, the water may cool slightly so it is important to continue to cook on high until the water comes to a full boil again. Then the heat should be turned down slightly but left high enough for the water to maintain a steady boil. 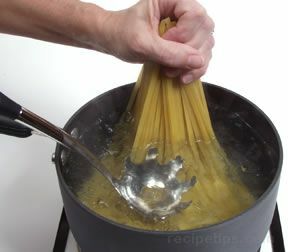 If pasta is added to water that is not at a full boil, or is cooked at a temperature that does not keep the water at a continuous boil, the pasta will absorb too much of the water and become soft and mushy. It is not necessary to cover the pot while cooking the pasta. 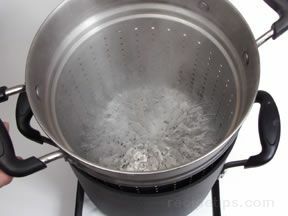 If the pot is covered while cooking, the heat will need to be turned down to prevent the water from boiling over, but left high enough so it is at a continuous boil. The cover would need to be removed periodically through the cooking time to stir the pasta so it does not stick together. Covering the pot will not affect the taste or speed up the cooking time. Long Dried Strands - Long strands of dried pasta, such as spaghetti and linguine, need to be gradually forced into the water as they soften. 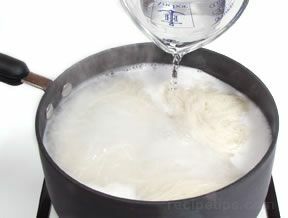 Hold the strands in one hand and submerge as much of the strands as possible into the boiling water. As the strands start to soften, push them further into the water as quickly as possible until the entire strands are submerged. Stir the strands as they continue to soften to prevent them from sticking together. 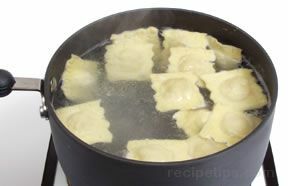 Stuffed Pasta - Stuffed pasta, such as ravioli, should be carefully placed in the boiling water, rather than poured in as you would with a dried pasta shape. This will help prevent the pasta from breaking open when placed in the water. To prevent the pasta from sticking and clumping together be sure to use plenty of water, cook at a consistent boil, and stir the pasta a couple of times throughout the cooking time. Be sure to stir to the bottom of the pot so the pasta does not stick to it. 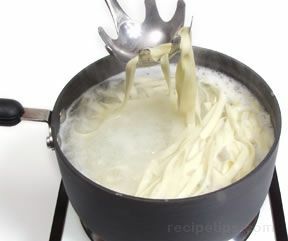 Not using enough water and insufficient stirring of the the pasta can also cause gooey pasta. Check the pasta for doneness a couple of times through the cooking period. Read the package for the suggested cooking time, which is generally meant to start after the pasta is added and it begins to boil again. Be sure to check to see if it is done at least two or three minutes before the suggested time. If not done, continue to check approximately every 30 seconds after that to ensure that it does not overcook. 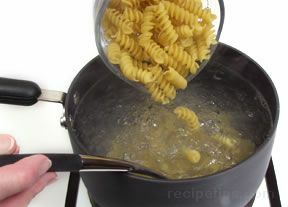 The best way to check for doneness is to remove a piece of pasta from the boiling water and taste test it. The pasta should be cooked to an "al dente" state, which is Italian for "to the tooth." This means the pasta should be tender but still have a slightly firm bite. Do not let the pasta become too soft. The amount of time it takes pasta to cook depends on the ingredients of the pasta, its size, its shape, and its thickness. Fresh Pasta - Fresh and homemade pasta take a lot less time to cook than dried pasta. 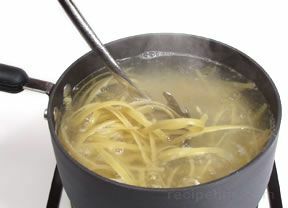 Some types can be done in less than 30 seconds after the pasta comes back to a full boil. It is important to have the colander ready for draining, the sauce ready to be added and serving dishes waiting before adding fresh pasta to boiling water. Start checking for doneness as soon as the water comes back to a full boil. 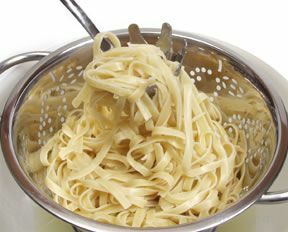 Check for doneness often and do not let it overcook because fresh pasta will become soft and mushy very quickly. Pasta for Other Dishes - When cooking pasta that is going to be used in a dish that requires additional cooking, such as lasagne, cannelloni, and casseroles, the pasta should be a little undercooked because it will be cooked further in the dish it is used in. Cook the pasta for 2/3 to 3/4 of the suggested cooking time. Also, pasta that is going to be used in a salad should be slightly undercooked. This will help prevent it from absorbing too much moisture from the dressing used on the salad. Stuffed Pasta - Stuffed pasta, such as ravioli, should be cooked more gently than most other pastas to prevent the stuffed pasta from splitting apart. Keep the water at a gentle boil while the pasta is cooking. Cooking times will be a little longer with stuffed pastas because of the double layers and the filling. Have the colander in the sink ready for draining the pasta before the pasta is done cooking. When the pasta is done, immediately remove from the heat. Remove and set aside 1 cup of the cooking water to use for thinning the sauce if it becomes too thick or for loosening the pasta if it becomes sticky. Drain the pasta as quickly as possible because it will continue to cook in the hot water. Gently shake the colander to remove most of the excess water. Leaving a little water on the pasta will help keep the pasta from sticking together. 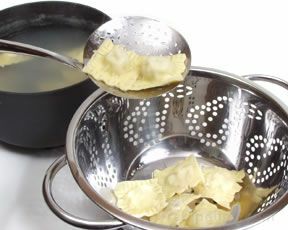 Stuffed pasta should be lifted out of the cooking water and placed in the colander, rather than poured into it. This will help prevent the pasta from being damaged or splitting open. 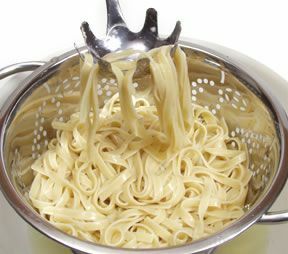 Use a slotted spoon or a skimmer to lift the pasta out of the water and place it in the colander to allow excess water to drain off or be blotted off with a paper towel. Do not rinse the pasta because the starches on its surface will allow the sauce to stick better and rinsing will only cool the pasta down faster. Serve the pasta in a warmed bowl or on a warmed plate. If pasta is drained but not served immediately it will begin to stick together and become hard to separate when you are ready to serve it. This is especially a problem when it happens to pasta strands. The strands become very difficult to separate. The pasta can be loosened by taking some of the cooking water that was saved when it was drained and pouring it over the pasta. As soon as you have the water poured over the pasta, use a spaghetti spoon or fork to loosen the pieces or strands. Serve immediately. 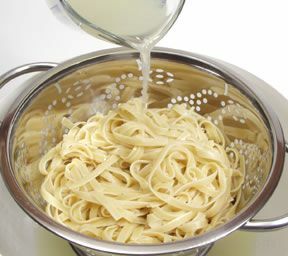 Rinsing the Pasta - The pasta should be rinsed if it is going to be used in a salad or if it is going to be stored and used at a later date. Rinse thoroughly with cold water. Pasta that is going to be used in another dish should also be rinsed in cold water so it does not continue cooking. It should also be drained well to prevent excess water from diluting the dish it is added to. Asian Noodles - Asian noodles should be drained and rinsed with cold water to remove starches before they are added to a stir-fry or soup. If the pasta is going to be served without a sauce, add approximately 1 tablespoon of olive oil to prevent the pasta from sticking together when it is served. If you do not want to use olive oil, you can toss the pasta with a little butter or use a small amount of the cooking water that was set aside. 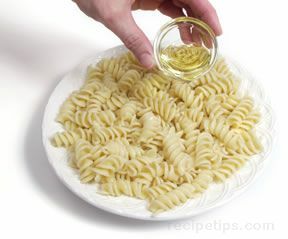 Toss the pasta to distribute the olive oil, butter or pasta water evenly throughout. Immediately after draining the pasta, pour it into a bowl. 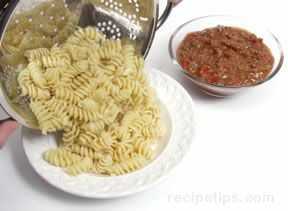 The sauce can be served separate from the pasta or stirred in with the pasta, using just enough sauce to coat the pasta evenly. Do not over sauce the pasta or the sauce will drown out the pasta's flavor. 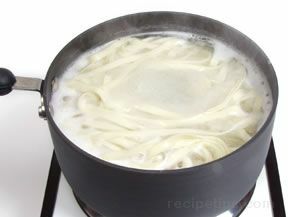 The pasta can also be added to the sauce in another pan in which the sauce and pasta can be further heated. Be sure that the sauce and pasta are heated just long enough for them to become sufficiently hot. Remove them from the heat as soon as possible otherwise the pasta can become overcooked. 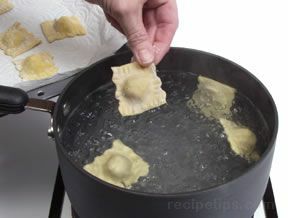 When boiling pasta, the use of a pasta insert can add convenience to the process. This method requires a pot large enough to hold the insert and it eliminates the need to drain the pasta in a colander placed in a sink. 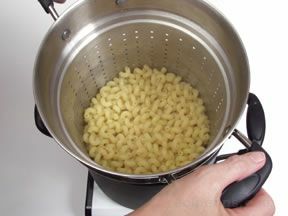 Because the pot and insert are fairly large, this method is generally not used when boiling a small amount of pasta. Add the proper amount of water to you the pot and then place the insert in the pot. Allow the water to come to a full boil. When the water comes to a full boil, add the pasta. 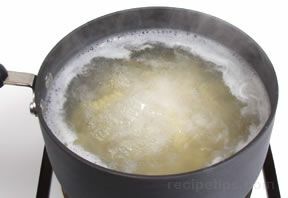 Allow the water to come to a full boil again and adjust heat so that the water is at a consistent boil. 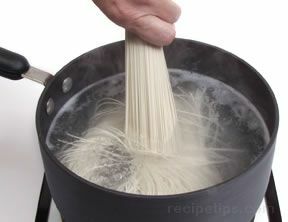 Stir frequently as the pasta is boiling to prevent it from sticking. 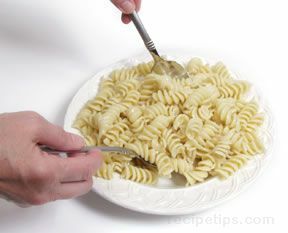 Start to check the pasta for doneness two or three minutes before the minimum suggested cooking time. 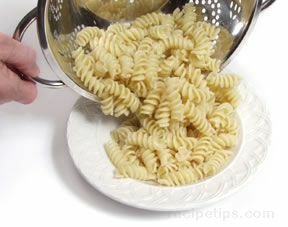 When the pasta is cooked to its proper doneness, lift the insert out of the water and allow the pasta to drain. 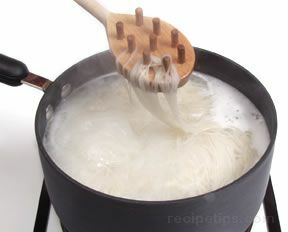 Many dried Asian noodles can be cooked using the Chinese method of boiling. This method generally takes a little longer than most other methods. 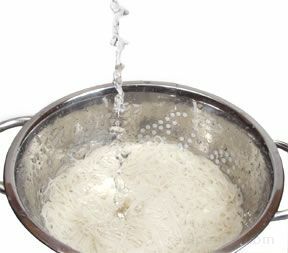 The Chinese method begins similar to the standard method of boiling by adding the noodles to a pot of rapidly boiling water. 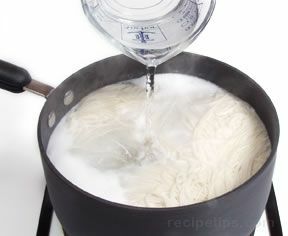 When the noodles come to a full boil again, add 1 cup of cold water. Allow the water to come to a full boil again and add another cup of cold water. 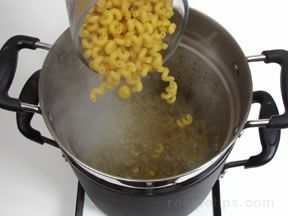 When the water boils for the 3rd time, check to see if the noodles are done. If not done, add more cold water and boil again. If the noodles will be added to a stir-fry or soup, they should be removed from the heat while they are still slightly firm, but if they are to be eaten cold, they should be cooked thoroughly. Asian noodles should be drained and rinsed with cold water to remove starches before they are added to a stir-fry or soup.